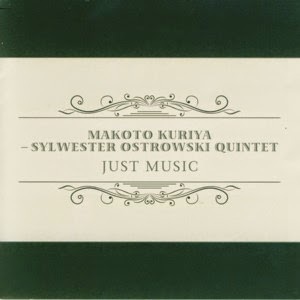 This is the debut album by the international quintet co-led by Japanese pianist/composer Makoto Kuriya and Polish saxophonist/composer Sylwester Ostrowski, which also includes Polish trumpeter Piotr Wojtasik and American rhythm section comprising of bassist Essiet Okon Essiet and drummer Newman Taylor Baker. The album presents nine compositions, five of which are originals co-composed by Ostrowski and Wojtasik, two are originals by Kuriya and the remaining two are standards. The music belongs to the melodic mainstream variety, with solid compositions, but completely non-original approach which puts the album somewhere in the proximity of 1950s or early 1960s American Jazz idiom. Of course these are all highly professional musicians, who can play really well, but the overall effect of this music is simply passé. Personally I find the phenomenon of European or Japanese musicians trying to imitate American Jazz sort of pathetic; they will never be able to beat the American Jazz tradition so they might as well find their own path and take the music elsewhere, which of course many do, especially the younger ones. Overall this is very well played mainstream American-like Jazz, which still has many followers all over the globe. For such audiences, this album is definitely worth investigating, although there are thousands of similar recordings out there deserving no less attention.